Is there a steampunk reading challenge somewhere? Apparently it's the next big thing, and I'd like to familiarize myself with the (sub)genre. But for things like whole new genres I need major *wait for it* MOTIVATION! Challenges! Exciting, shiny contests! Those are good. I've checked out the Wikipedia entry, and Google searched it (found Steampunkopedia, Brass Goggles and Steampunk Scholar), but haven't come across an honest-to-goodness reading challenge. I'd be willing to host one, maybe...would you be interested? Pictures found at Gail Carriger's blog. splatterpunk, yes. steampunk? i'm curious! I haven't seen one out there, and it does seem to be the next big thing. I think you need to host a challenge for it! Oooooo, cool! I've never heard of this before. Those costumes seem amazing for halloween-costume-stealing! What a fantastic idea! I'd definitely be interested. I'm like you--I've been hearing a lot about Steampunk and would love to find out what it's all about, but haven't had a good excuse to give myself permission yet. A Steampunk challenge sounds like just the thing! Let me know what kind of support I can offer. No, I haven't seen anything around, but it would be a cool challenge esp. with Scott Westerfeld's new book. I could probably hop on board a steampunk reading challenge, depending on the time frame. I'm currently gathering interesting titles--"Whitechapel Gods" and "Leviathan" have my eye at the moment--for my wish list. 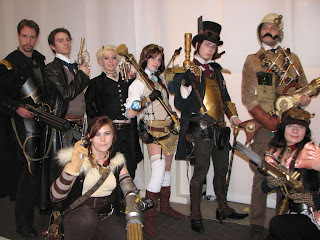 I think the challenge of such a challenge is the availability of steampunk books. A lot of the really great ones aren't going to available at the local Borders, or Chapters, or whatever. And while "Whitechapel Gods" is good fun, it wouldn't be my recommendation for the first read in such a challenge. I think I'd suggest one of the anthologies, either "Steampunk" or "Extraordinary Engines." That way, you're not wallowing in a novel if you don't like the particular style of the author. 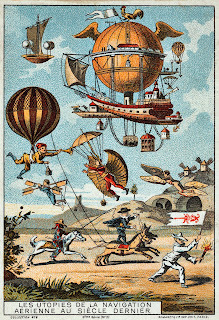 Steampunk is a varied subgenre in terms of plots, tones, and approaches. If you feel the need to do a book, I recommend The Alchemy of Stone. I'm really curious about this genre too. I don't really know were to start tho so I'd be up for a challenge or recs. hmmm I'm not sure. I know a few steampunk novels haven't read them myself, but I've played some steampunk games. It's very interesting:) would love it if there was a reading challenge like that. I'd be up for it if it was an easy challenge. I've never read any steampunk, but have considered it. I've not heard of this. But then I'm old and prone to not know what the next big thing is! What exactly is it? superCool! i'm in if you're so inclined. Bonecrusher and Leviathan are a couple recent books i've seen that come to mine.